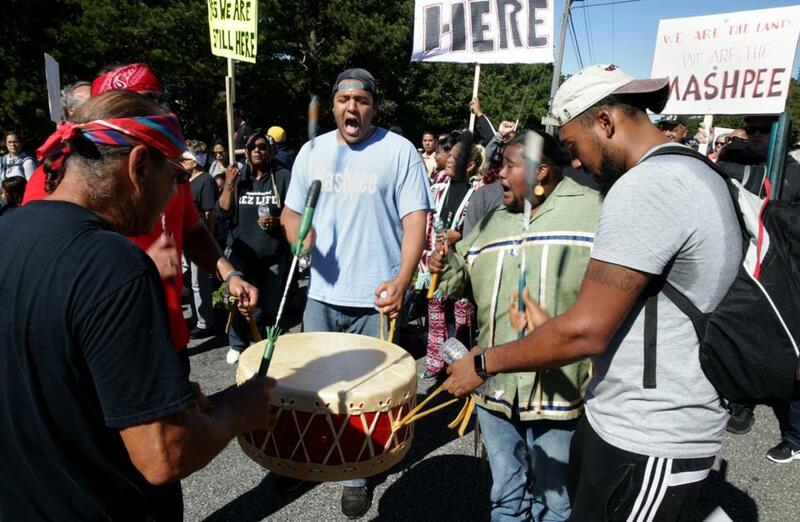 Mashpee Wampanoag chanted during Saturday’s protest. The tribe has filed a federal lawsuit seeking to retain control of its reservation. 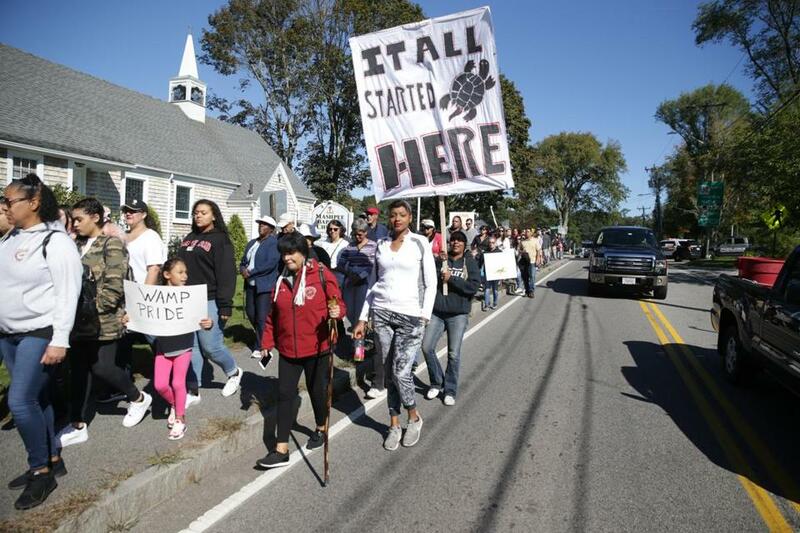 MASHPEE — Nearly 200 members and supporters of the Mashpee Wampanoag tribe marched through this Cape Cod town on Saturday morning to protest a Trump administration ruling that would rescind a 2015 federal designation holding land in trust on behalf of the tribe. If the tribe cannot retain control of the 321 acres in Mashpee and Taunton, it will be unable to build a planned $1 billion resort casino there. But the larger issue, members said, is the tribe’s cultural and moral claim to the land, which lies not far from where the Wampanoag greeted the Pilgrims who founded Plymouth Colony and later joined them in the first Thanksgiving. “It’s truly about the land that we stand on, the blood and the bones of our ancestors that come from this land,” Cedric Cromwell, the Mashpee Wampanoag tribal council chairman, said. Tribal members marched Saturday to the rhythms of drumbeats and chants alongside supporters from other Native American tribes and those with no tribal affiliation. Some wore traditional clothing, jewelry, feathers in their hair, or other symbols of their heritage. Nearly 200 protestors marched on Saturday to protest a Trump administration ruling that would rescind a 2015 federal designation holding land in trust on behalf of the tribe. On Thursday, the tribe filed a federal lawsuit seeking to retain its reservation, arguing that the ruling announced last month by the US Department of the Interior was “arbitrary” and “capricious,” and ignored evidence provided by the tribe. In that decision, the Interior Department said it could not hold land in trust for the Wampanoag because the tribe wasn’t under federal jurisdiction when Congress passed the Indian Reorganization Act in 1934. Tribe member Laverne Jackson, 42, of Falmouth, said she hopes that the tribe won’t have to go to court to keep the land. “I wish it wasn’t even necessary. . . . I’d like to sit down and talk and just be done with this, and let’s put it to bed. Let’s put it to rest. It’s been long enough,” said Jackson, who wore a black baseball cap with the phrase “Real Womp” written in glittering silver letters. Jackson said she remembers marching down the same Mashpee roads demanding tribal rights with her grandmother 30 years ago. On Saturday, she marched with her granddaughter, as well as her four daughters, several sisters, and many aunts and uncles. She expressed exasperation that they and so many others were once more fighting for tribal lands just three years after it appeared that the long battle had ended. René King, 62, of Centerville, was one of the marchers with no personal ties to the Mashpee Wampanoag tribe, though she said she has some Narragansett ancestry. Earl Cash Jr., who said he is the tribe’s medicine man and uses the tribal name Soaring Eagle, carried a basket of burning sage during the march. He said he and other members of the tribe owe it to their ancestors, who faced greater challenges than those of today, to continue fighting. Material from the Associated Press was used in this report. Jeremy C. Fox can be reached at jeremy.fox@globe.com.